Safe House director Daniel Espinosa and The Wanderers and Clockers scribe Richard Price (adapting Tom Rob Smith’s novel) are hell bent on making Child 44 unlike other serial killer movies. There is a lot of work gone into the backstory, the setting, to building up the characters involved, and the politics surrounding the murders. In fact, it spends so much time doing this the whole serial killer aspect can get lost and forgotten about. To use a screenwriting parlance, it lays a lot of pipe. In Russia 1933, a young Leo Demidov (Hardy) escapes the orphanage and is taken in by a Bolshevik soldier. He grows up to be a Russian hero, the soldier snapped in that iconic photo planting the red flag atop the Reichstag in Berlin. Fast forward to 1953 and despite an aversion to violence he’s a rising star in the MGB, hunting down suspected traitors (like Jason Clarke). He’s also in a staid marriage with Raisa (Rapace) and when she’s accused of plotting against the state Demidov is expected to condemn her; when he doesn’t he is demoted to the sticks and General Nesterov’s (Oldman) militia. Meanwhile, Demidov’s ambitious rival, the psychotic Vasili (Kinnaman), uses the friction between the couple to woo Raisa. That’s a lot of pipe and we haven’t even got around to the murders. But here goes. Children’s mutilated bodies are discovered beside train tracks in Moscow but because Stalin has declared homicide a Western disease - ‘there is no murder in paradise’ – a haunted Demidov can’t investigate. However, when more bodies are discovered he approaches Nesterov with the treacherous claim that a child murderer is at large. Maybe having novelist (Price has had as many books published as screenplays produced) adapt a novel wasn’t the way to go. A screenwriter’s instinct is to cut out what’s not absolutely necessary to the narrative but a novelist wants to include as much detail as possible. And that’s what we have here: detail. And more detail. So much so that there are no subplots - every strand of the story is given equal weight and screentime. 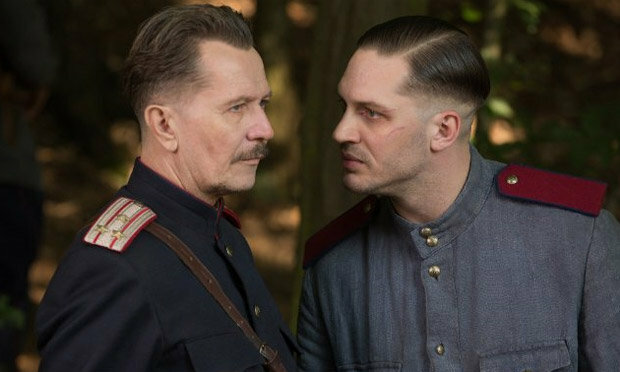 But because all plots involve Tom Hardy, Child 44 turns out to be his best performance since Bronson. With his dead eyes, shaved head, pale skin and scarred face, he looks ill here, the hulking frame in a perpetual stoop. Rapace’s quiet determination turns the head too, which is something since she really isn’t needed. The film looks pretty too, in an ugly way. The grey streets and cramped, shadowy apartments heighten the Orwellian oppressive mood Espinosa is after - it feels as if the joy has been sucked out of the world. It’s muddled and unfocussed, and the appearance of the child killer long before he is discovered goes a long way to killing the whodunit tension the story might have had, but Child 44’s attempt to turn in a different serial killer film is at least admirable.